Storage boxes offer heavy-duty quality, strength and security. Ideal for stacking without shelving. The 3" dustproof seal ensures a flat box top for improved stability while stacking. FastFold One Step Setup feature makes box assembly fast and easy. 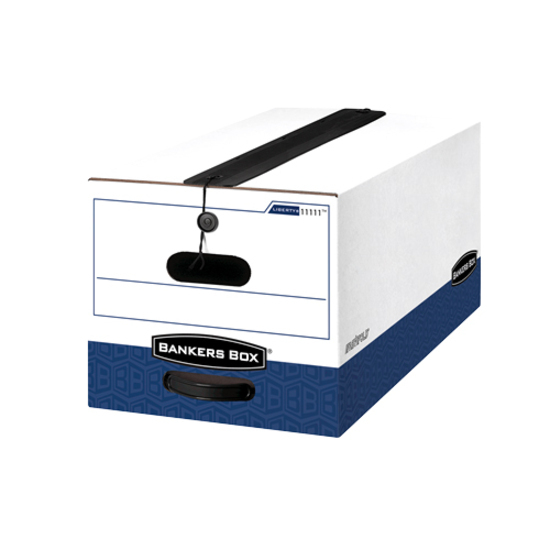 String-and-button closure keeps your legal-size secure, even if box is overturned. Reinforced plastic handle makes it easy to pull box off shelving. Maximum security box is built for heavy daily usage and maximum stackability. Stacking weight is 900 lb. Storage boxes offer heavy-duty quality, strength and security. Ideal for stacking without shelving. The 3"" dustproof seal ensures a flat box top for improved stability while stacking. FastFold One Step Setup feature makes box assembly fast and easy. 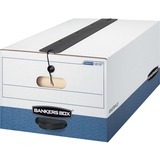 String-and-button closure keeps your legal-size files secure, even if the box is overturned. Reinforced plastic handle makes it easy to pull box off shelving. Maximum security box is built for heavy daily usage and maximum stackability. Stacking weight is 900 lb. Legal - 8 1/2" x 14" Sheet Size - 3 1/2" Expansion - 12.5 pt. Folder Thickness - Redrope - Kraft - Recycled - 50 / Box"